Crete is more like a small country than another Greek island. Its not just Greeces largest island, but arguably its most fascinating and diverse. Its remarkable history is evident across the island, from the ruins of the Minoan palace of Knossos to the Venetian fortresses of Rethymo; from old mosques and Byzantine monasteries to the cave that is the legendary birthplace of Zeus. The Venetian port of Hania in Western Crete is one of Greeces most evocative cities and the capital, Iraklio, is a dynamic city, the fifth largest in Greece. Crete is renowned for its natural beauty and diverse landscape. Spectacular mountain ranges dotted with caves are sliced by dramatic gorges that spill out to sea. The rugged interior is interspersed with vast plateaus and fertile plains. The east boasts Europes only palm-tree forest beach and the south coast has some of the most stunning beaches and isolated coves. ARCHAEOLOGICAL MUSEUM IN IRAKLIO: The Iraklion (Heraklion) Archaeological Museum was founded in 1883. Initially, when it was still simply a collection of antiquities, it was housed in two rooms near Agios Minas. KNOSSOS: Knossos was undeniably the capital of Minoan Crete. It is grander, more complex, and more flamboyant than any of the other palaces known to us, and it is located about twenty minutes south of the modern port town of Iraklio. MONASTERY OF ARKADI: The impressive church, with its two naves dedicated to Saint Constantine and Saint Helen, and to Our Lord. Due to the holocaust it suffered in 1866, this has become the island's most famous monastery. It lies on a low plateau, 23 kilometres from the town of Rethymno. GORTYS: Gortys, also known as Gortyn or Gortyna is one of the most important cities in Crete with an unbroken history of 6,000 years and one of the most extensive archaeological sites in Greece. It lies in south central Crete in the fertile Mesara plain, the site of the first human habitation of Crete at the end of the Neolithic period (5th millennium BC). 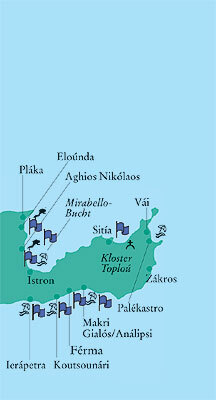 KATO ZAKROS: It truly lies at the eastern end of Crete. A green oasis in a stark landscape, in a bay very well protected from most winds, the only reason that it has remained a small place, without much of a tourist infrastructure, is because the Minoan palace of Zakros which was discovered in 1961 is still not fully excavated. As nobody knows the full extent of the palace the government imposed a blanket ban on building in the area. PHAISTOS: The palace of Phaistos commands the Messara plain from its location on a low hill, and it is the second in size palace of Crete after Knossos. LASSITH PLATEAU: Precipitous Mountain peaks, all more than 1,000 metres high, surround it, forming a strong natural fortification that has only eight relatively accessible passes. The waters that run from everywhere each spring, when the mountain snows melt, enrich the earth with their minerals and then drain off into the swallow-hole on the southwest corner of the plateau, near the village of Kato Metohi. MATALA: with its sandy beach, the brilliant waters and its caves was chosen in late sixties by the "flowers' children" to become their "paradise on earth". Though not frequented by hippies anymore, Matala, still carries a certain aura of liberty and of "flower power". PALACE OF MALIA: The site was inhabited in the Neolithic and early Minoan period (6000- 2000 BC), but very little trace remains. MONASTERY OF TOPLOU: The historic castle-monastery of Toplou one of the most significant and richest monasteries in Crete, is situated 6 km north from Palekastro. It has a quadrangular shape and it's surrounded by a strong 10m high wall. Well-preserved 14th century's frescoes decorate these walls. VAI: Vai is famous for its palm forest located right on the beach. It is the largest palm forest in Crete and these palms are endemic Cretan palms. THE GORGE OF SAMARIA: The gorge is 16 km long, starting at an altitude of 1250m and taking you all the way down to the shores of the Libyan sea in Agia Roumeli. The walk through the National Park of Samaria is 13 km but you will have to walk the extra 3 km to Agia Roumeli from the exit of the National Park making it 16 km. ZAROS: Zaros is a picturesque village located at the southern slope of the mountain IDI (Psiloritis) at 340m.